So I thought I’d challenge my belief that California can’t do Pinot Noir – it all ends-up soft and sweet strawberry. 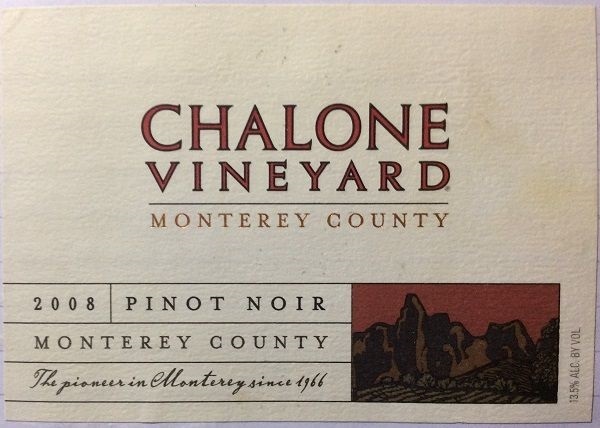 Chalone is its own cool climate area, so I figured see what a cooler region could do. It was better than most, and if I suspended opinion and just thought of it as a £12 red, it was nice enough. But still not quite there. Mid-depth ruby, still with some purple glints. Quite intense: liquorice, graphite and blueberry that opens into strawberry and a touch of jamminess. Alcohol starts to become more obvious. Herbal note. Touch of soft, sweet spice, but not intrusive. Medium+ bodied, velvety with medium acidity. Soft flavour and texture, but not so soupy. On the borderline between fruity and savoury styles. Could do with more structure though.